Tonight we had Marla Brooks of Stirring the Cauldron discussing her new Oracle Deck. Henry had Marla discuss the distinctions between Oracle and "regular" Tarot. She had sought out an Oracle deck but couldn't find any, so she realized there was a need. Ceiling Cat Barbara, who reads from the Toth deck, she had tried out Marla's deck, and found it quite functional. In the chat room Marla pointed out there being an Oracle Deck Facebook page. After the first break, CC reported our having listeners in the UK, the US, Australia, Canada, and Unknown. Marla did some readings for listeners, the first communicating via our Paranormal View Facebook page. After the second break, we discussed local hauntings, such as Ghost Adventures actually investigating the Hollywood Sign, and the Cecil Hotel with the strange video before her "suicide." Marla pulled for me the Witch's Circe card: unity, comfort, and protection, to call upon against problems. She read me the incantation. I pointed out my avoid homelessness campaign. Marla provided her show site, website, her Facebook, her Twitter and the Oracle page on Facebook. Kat, provided her website Twitter jinxed twitter Henry conveyed our guest the next week would be Thomas White, author of the Haunted Roads of Western Pennsylvania, and we wrapped out. 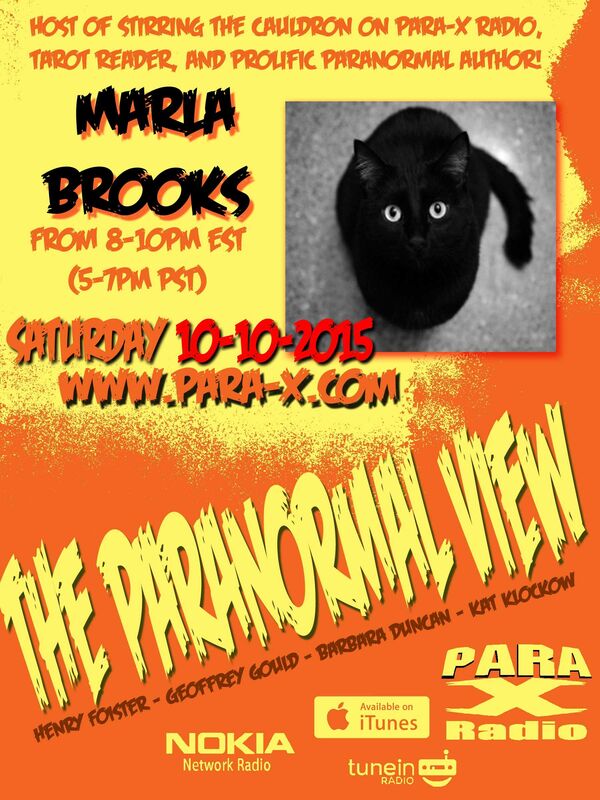 10 October 2015 The Paranormal View.